Mr. Ernst here. This book’s modern storyline is set in July 1983. Some readers find it hard to imagine life back then. For others, that time can evoke cherished memories and “Oh, I remember that!” moments. This mystery revolves around memories of our Civil War, including murders tied to a reenactment at Old World Wisconsin, the historic site where Chloe works, and a tragic love story about German immigrants who settle in Wisconsin at the war’s beginning in 1861. Few people have detailed knowledge of the experiences of those who were caught up in the war, or those who were reenacting it in the 1980s. To bring those time periods alive for Chloe readers, Kathleen relied on her memories of the twelve years she spent working at Old World, first as a costumed interpreter and then as its Curator of Interpretation and Collections. Her time in the latter role included being the outdoor ethnic museum’s host responsible for organizing the Civil War events held there. 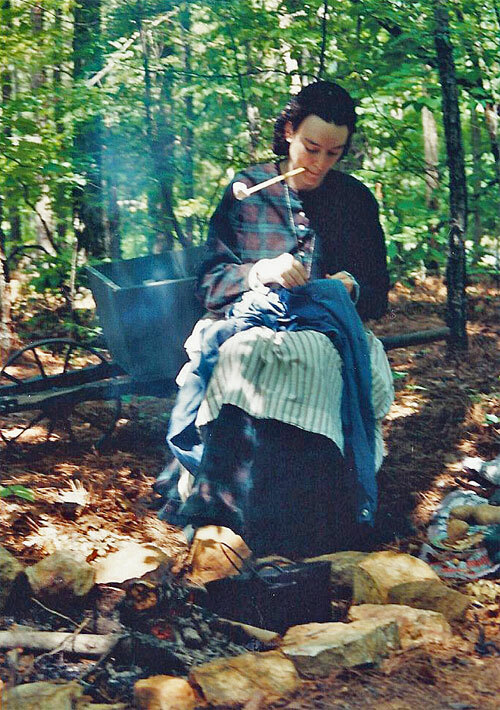 Kathleen also drew upon her years spent as a civilian Civil War reenactor, during which she observed and took part in numerous reenactments and living history events. The influence of these experiences on what Kathleen has written about Chloe, Roelke, Rosina, and Klaus are explored in her recent blog post, A Memory of Muskets—A Retrospective. Additional insights are available on the Memory Of Muskets page on her website. Kathleen also drew upon my memories of portraying a Union soldier. At the heart of them is a love story about Kathleen and me. My entry into “The Hobby” came about as a result of doing genealogical research on the military service of my maternal great-great grandfather. In 1862 James Francis Cantwell answered President Abraham Lincoln’s call for 100,000 additional volunteers to serve three years in the Union Army. During the war he marched some 3,750 miles through Kentucky, Tennessee, and Georgia before arriving in North Carolina by railroad train (“the cars”) and sailing ship. He fought in 26 engagements, including: the bloody battle of Perryville, KY; the defense of Knoxville, TN; the vicious fighting at Resaca and Kenesaw Mountain, GA; the capture of Atlanta, a narrow escape at Spring Hill, the slaughter at Franklin, and the destruction of General Hood’s army at Nashville. At war’s end he returned to his family, unlike 620,000 other soldiers. Researching his military records motivated me to learn even more. Taking his photo to a Civil War event, I showed it to a group of reenactors who looked and drilled like they knew what they were doing. The 33rd Wisconsin. Photographer unknown. The two dozen or so reenactors who’d been lounging about jumped to their feet and scrambled to form two lines behind the stacked muskets. Stacked muskets at Old World. Photo courtesy of John Wedeward. The soldiers on the right end of the lines stood still. Everyone else jostled a bit as they came to stand shoulder to shoulder. Siggelkow, the tallest man, was on the left. Roelke also spotted Kyle Fassbender, the young interpreter. The men moved smartly through each command—taking arms, removing bayonets, shouldering arms. These are the moves my ancestor learned, Roelke thought. 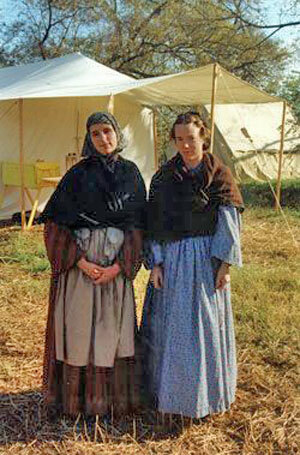 The reenactors were able to tell me a great deal about my ancestor from the photo. Then they made me an offer: loan of a uniform and musket, and instruction in the soldierly arts my GGGF had been taught when he first entered the Union Army Infantry. Accepting the offer, I joined the 33rd Wisconsin, which Kathleen used as a model for the 9th Wisconsin in the book, and spent the next decade learning about and reenacting the Civil War. It would shortly prove to be one of my best decisions ever. While the 33rd’s members did run around with guns, they were at heart military historians. They were dedicated to being as authentic as possible for two reasons: to increase their knowledge of the experiences of the Union soldiers they portrayed, and to respectfully honor those men who fought to preserve the United States of America. Nestled into its 576 acres of gentle hills, forests, kettle ponds and prairies are over sixty historic buildings, carefully relocated from around the state and lovingly restored. In addition to a crossroads village, there are three working farms dating from the Civil War era, including the German Schultz Family Farm featured in the book. Schultz Family Farm. Photo by Kathleen Ernst. Although familiar with the view, Chloe felt the spell. The land to their left was forested. Wheat rippled on their right. Beyond the field sat a tidy half-timbered home, and a stable and huge grain barn with thatched roofs. Laundry hung on a line. Oxen browsed in the pasture. It was a bubble moment—when everything looked and sounded and smelled and felt so real that for an instant, just an instant, it felt as if time had truly slipped. That weekend we did military “living history.” Which is to say we portrayed to the public portions of the common soldier’s day-to-day military experiences—without a battle. Ready to enlist draftees. Photo courtesy of John Wedeward. …the Village buildings all closed temporarily so visitors and interpreters could attend the reenactment of the 1863 draft. Kyle Fassbender made an impassioned speech opposing the vile act. A member of the 9th, dressed in an impressive coat and top hat, had the honor of pretending to spin the draft drum and reading names. The draftees reacted with groans, complaints, or flight. The visitors loved it. Later we practiced the manual of arms, conducted loading and firing demonstrations, did bayonet drill, and marched in the intricate, shoulder-to-shoulder infantry formations (invented by Napoleon). Marching at Old World. Photo courtesy of John Wedeward. We also spent time portraying typical camp life, including cooking meals, cleaning weapons, holding mail call, and undergoing inspection. Reenactor company at Old World. Photo by Kathleen Ernst. It was at Old World that I first experienced the camaraderie of living outdoors with a group of male comrades. Spending weekends in the wool uniforms and leather accoutrements of a Union infantryman. Standing shoulder-to-shoulder as we drilled. As my knowledge and experience grew over time, I began interpreting to the public. Helping them understand what they were observing, and answering their questions, became one of my favorite tasks. Some of the public had relatives who served in the Civil War and wanted to learn more about what their ancestor experienced. Some folks were military vets who would talk about the similarities and differences between their service and what they were seeing. Diederich took over again. “We will load in nine times,” he told the crowd. “Load in nine times” proved to mean that nine different steps were needed to load a single round. Roelke tried to imagine doing that while being shot at. Loading muskets at Old World. Photo courtesy of John Wedeward. I still remember my first time taking part in a company firing demonstration. I was in the front rank, and even though I knew we were firing blanks… I’ll let Roelke describe it. When a formation fires, the noise is deafening for those in the ranks. Everything in front of you disappears in a white fog, and the air you inhale smells like rotten eggs. The explosions were precise. White smoke jetted from the muzzles. Babies cried. Excited kids bounced on their toes. Adults murmured in awe. The weapons boomed louder than modern guns. Roelke smelled black powder—pungent and faintly familiar. Musket volley at Old World. Photo courtesy of John Wedeward. My time as a “Boy in Blue” also included long-distance drives to visit Civil War battlefields, and take part in huge public battle reenactments. Shiloh, Muddy Shiloh. Photographer unknown. Over the course of a weekend we’d portray parts of an original battle. Sometimes there were 10,000 or more Confederate and Union infantry, cavalry, artillery, and medical reenactors ‘on the field’. At one event an estimated 200,000 musket blanks were fired. The smoke and dust grew thick, the constant noise deafening, and the humid heat oppressive. Photos by Svend Olsen (top left) and John Atkinson. Kathleen drew from my memories for this passage in the book. “Reenacting seems like an interesting hobby,” Roelke said, in a congenial Tell me more tone most unlike him. Kathleen’s own memories served as the basis for Chloe’s thoughts. His description reminded Chloe of big events she’d attended. It had been staggering to think that the thousands of reenactors taking the field were only a small percentage of the actual number of men who’d once fought and bled and died there. Critics accused reenactors of playing, of romanticizing a ghastly and bloody conflict, but a thoughtful reenactment could help onlookers move past abstract dates and figures. Roelke simply couldn’t understand how it felt to be in the moment at a well-done event. As you might imagine, my memories of those ‘fights’ are incredibly vivid and exciting. And yet my fondest recollections come from after the public departed the battle reenactment or living history event. We’d sit around a campfire, under the stars, smoking stoogies (cheap cigars), sipping whiskey from fire-blackened tin cups, singing old Civil War songs, and talking late into the night about the war. Often we slept on the ground, ‘campaign’ style, rolled up in reproduction gum blankets. Other times we camped under canvas shelter halves (first introduced during the war and nicknamed “pup tents” by the soldiers because they looked like small dog houses). I greatly valued that such weekends caused the constant buzz of contemporary civilization to fade from my mind. Reenacting reduced life to the basics: hot/cold, wet/dry, hungry/thirsty. I always returned home physically exhausted, but mentally refreshed. Yet eventually it grew increasingly difficult to manage the physical challenges involved. And truth be told, my graying beard made me look way too old to pass for any of the men who actually fought the war. As for Kathleen and I, we were married in St. Peter’s Church at Old World, surrounded by family, her co-workers, and our reenactor friends. Thanks Sergeant Cantwell for bringing us together. I owe you big time. Hopefully this post has piqued your interest in discovering more about the ‘people, places and the past’ in A Memory of Muskets. There’s a whole page full of information about this book on Kathleen’s website, including the first chapter, the author’s introduction to the story, a discussion guide for book clubs, a pair of custom Google map showing story locations and photos, recipes for foods mentioned in the story, a slide show of objects featured in the book, public radio interviews with Kathleen and a reading of the first chapter, blog posts that offer additional background about aspects of the story, and links to booksellers that offer it in ebook, and printed formats. Explore them by clicking HERE. Next month I’ll post an article about researching Mining For Justice, the eighth book in the Chloe Ellefson Historic Sites mystery series. I’m often asked where my interest in the American Civil War comes from. Growing up in Maryland, I had lots of opportunities to visit Civil War battlefields. Since Maryland was a border state, I also had plenty of opportunities to consider the experiences of people on both sides of the conflict. And in addition to learning about the soldiers’ lives, I always tried to imagine what it was like for civilians who found themselves in the midst of fighting. After moving to Wisconsin, I got a job at a large living history site called Old World Wisconsin. For the first two years that I worked there I spent every day in period clothing, going about daily chores from spring through fall. I got a lot of hands-on practice with cooking, craftwork, gardening, livestock, etc., etc. Later, I did a lot of the research that helped develop new programming at the historic site. Some of the details in my books come from those experiences. 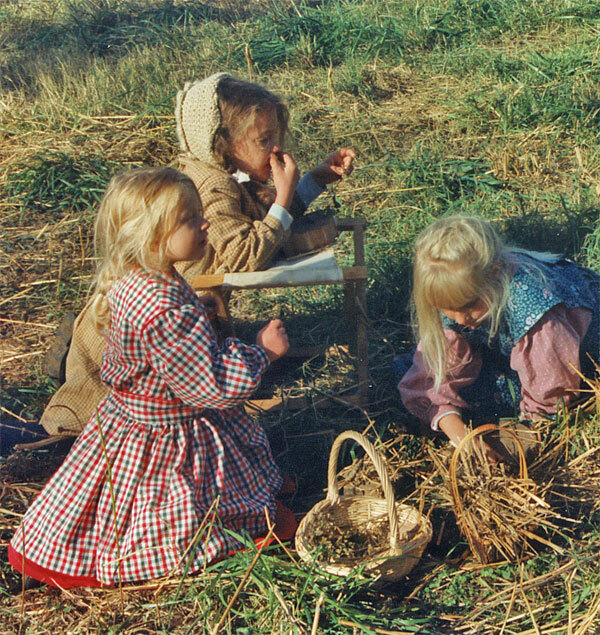 Three of the farms at Old World Wisconsin have been restored to the 1860s. Working at those helped me gain insight into women’s work during the Civil War years. 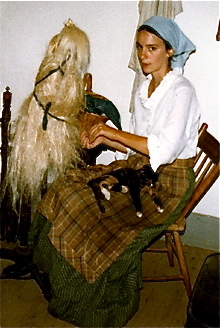 I’m spinning flax at the 1860 Schulz House in the German area, back in 1983. During that time I also got involved in Civil War reenacting. Most visitors come to Civil War reenactments thinking only about soldiers and battles. These men honor soldiers who fought in the Civil War by portraying them at special events and reenactments. Civilian reenactors in the units I belonged to tried to add an additional layer by portraying the experiences of women, children, and non-military men at events around the country. I usually portrayed rural working-class women. 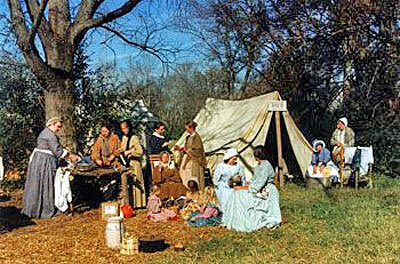 This is my husband and me in a makeshift campsite for refugees at a Civil War event at the Wade House Historic Site. This photo dates to the 1990s. 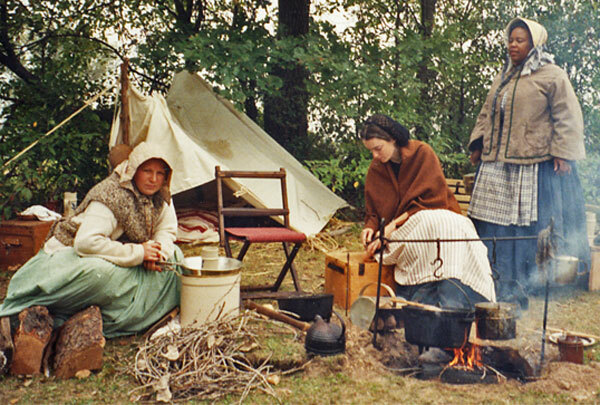 Camping with my friends Sue and Yulanda, sometime in the 1990s, at another event portraying people displaced by the war. In October, 1994, I participated in a refugee camp scenario planned as part of a huge reenactment held in Spring Hill, Tennessee. The day we set up camp was marked by torrential rain, and soon the entire area was a sea of mud. 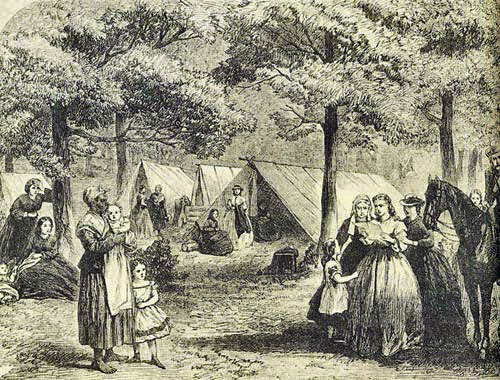 I slept in a small tent that evening, but I remember well the women who managed to spend the night under makeshift shelters formed from quilts and gum blankets—just as families left homeless during the Civil War had to do. Fortunately it didn’t rain all weekend! The event organizers had worked hard to prepare a full weekend for the participants. We were busy with food preparation and cleanup, inspections from the provost guard, and interacting with other reenactors and event visitors. Meghan and Stephanie, two of my fellow refugees. Before that event was over, I knew I wanted to write a novel about children who end up as refugees during the Civil War. Hearts of Stone began taking shape in my mind. My main character, Hannah, is a young teen forced to leave home her three younger siblings when the war tears her community apart. With both parents dead, she tries desperately to keep her little family together. She takes the young ones to Nashville, believing that city provided their best hope, but her heart aches to be back home on Cumberland Mountain in Tennessee’s eastern mountains. The children participating in the scenario at Spring Hill were adorable, and what an experience for them! But watching them made me feel sad as I thought about all the real children who became homeless during the Civil War. These girls helped me imagine Hannah’s little sisters, Mary and Maude. I looked at photographs and artwork, too. 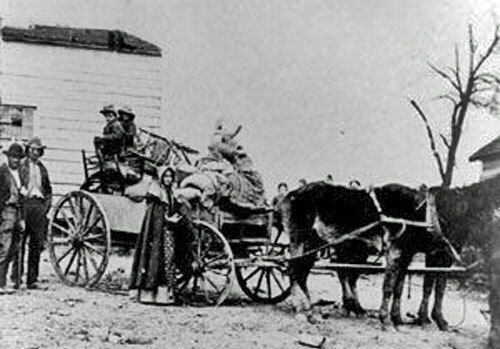 This photo of real Civil War refugees is from the National Archives. This period newspaper illustration shows refugees camping in the woods. It took me about ten years to research, write, revise (many times!) and find a publisher for Hearts of Stone. I believed in the story, and was delighted when Dutton published the book. I hope it touches your heart. PS: Once published, this book had a wonderful reception! 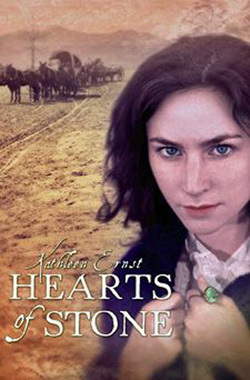 Among other honors, Hearts of Stone was named an Editors’ Choice Selection of the Historical Novels Review. The Society of Midland Authors’ Children’s Literature Award winner!